Life is sacred. We should keep it going for as long as we can. Life is sacred but keeping someone on life support is wrong. We should switch it off and let nature take over. Life is sacred, but is someone in a PVS really living? Quality of Life How can you have any quality of life wired up to a machine? You should switch it off because a life like that is not worth living. But maybe someone in a PVS is having a nice time. We don’t know what being in a PVS is like. So it’s not up to us to decide to end it. 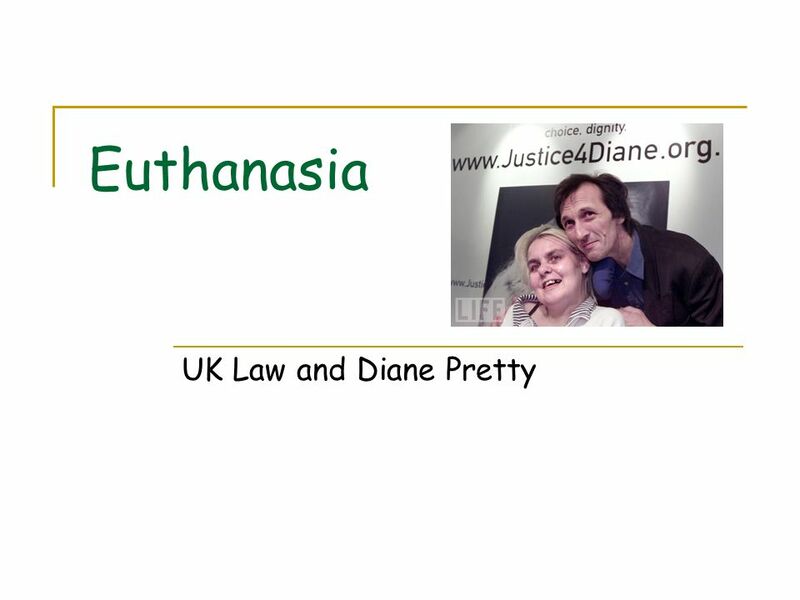 whether you agree or disagree with the current UK Law; what your thoughts are on some of the results of trials to do with the UK law and euthanasia – specifically should Diane Pretty have been allowed to have her husband help her to die? 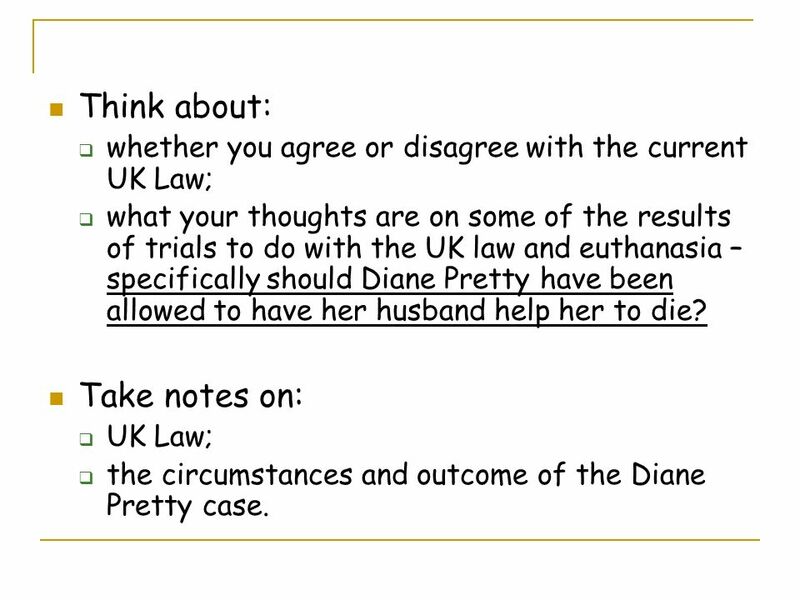 Take notes on: UK Law; the circumstances and outcome of the Diane Pretty case. 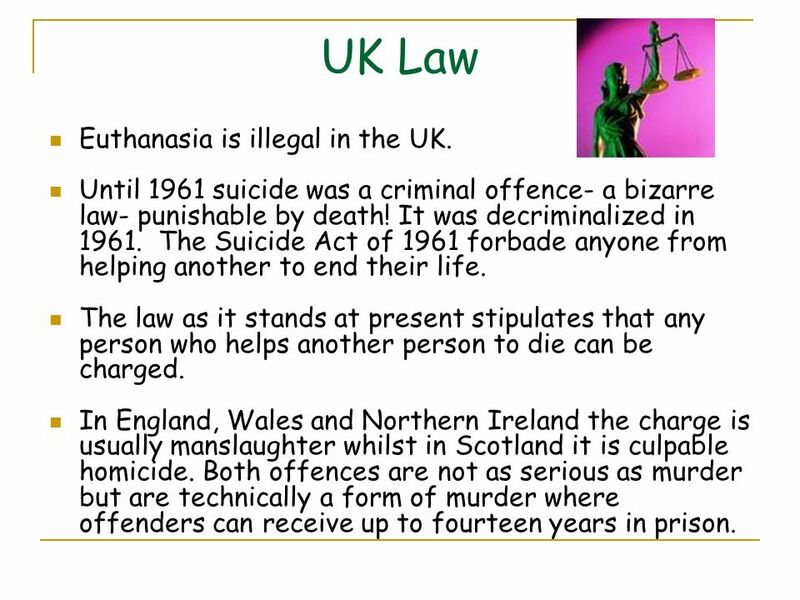 4 UK Law Euthanasia is illegal in the UK. Until 1961 suicide was a criminal offence- a bizarre law- punishable by death! It was decriminalized in The Suicide Act of 1961 forbade anyone from helping another to end their life. The law as it stands at present stipulates that any person who helps another person to die can be charged. In England, Wales and Northern Ireland the charge is usually manslaughter whilst in Scotland it is culpable homicide. Both offences are not as serious as murder but are technically a form of murder where offenders can receive up to fourteen years in prison. 5 UK Law in practice The Act allows the Director of Public Prosecutions to decide whether or not to go ahead with the case of this kind of unlawful killing. The sentences handed down on both sides of the border are very often influenced by the desperately harrowing circumstances of the victim and their family. Sentences are almost always non custodial and it is not unusual for cases to be dismissed. 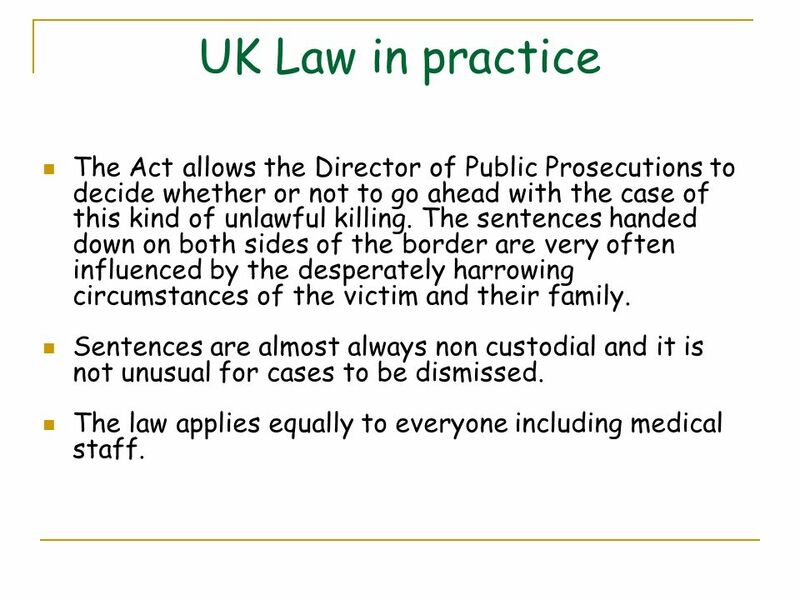 The law applies equally to everyone including medical staff. 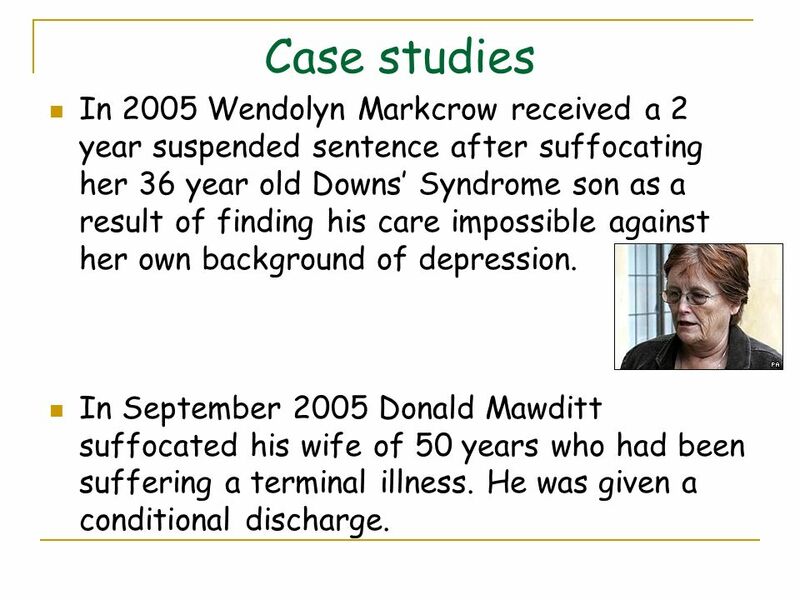 6 Case studies In 2005 Wendolyn Markcrow received a 2 year suspended sentence after suffocating her 36 year old Downs’ Syndrome son as a result of finding his care impossible against her own background of depression. In September 2005 Donald Mawditt suffocated his wife of 50 years who had been suffering a terminal illness. He was given a conditional discharge. 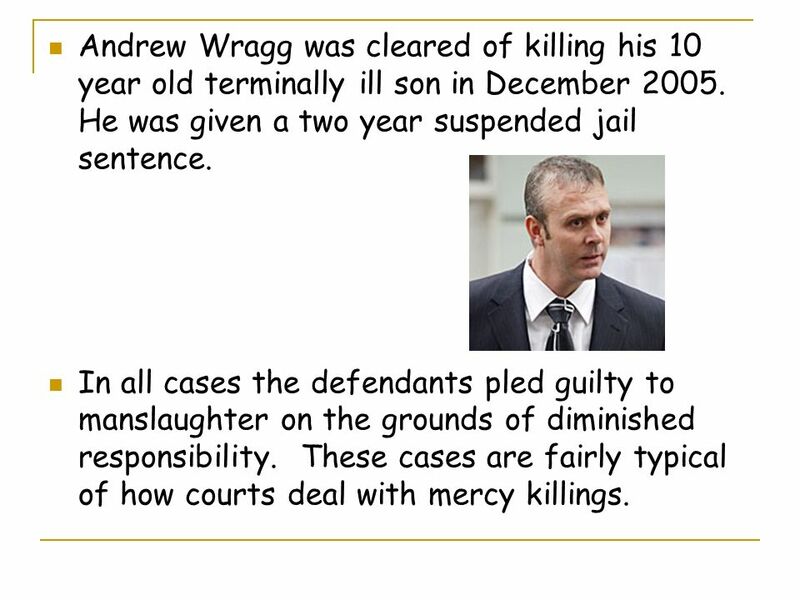 7 Andrew Wragg was cleared of killing his 10 year old terminally ill son in December He was given a two year suspended jail sentence. In all cases the defendants pled guilty to manslaughter on the grounds of diminished responsibility. These cases are fairly typical of how courts deal with mercy killings. 8 What are your thoughts on what should happen to someone who breaks the UK Law as it stands? 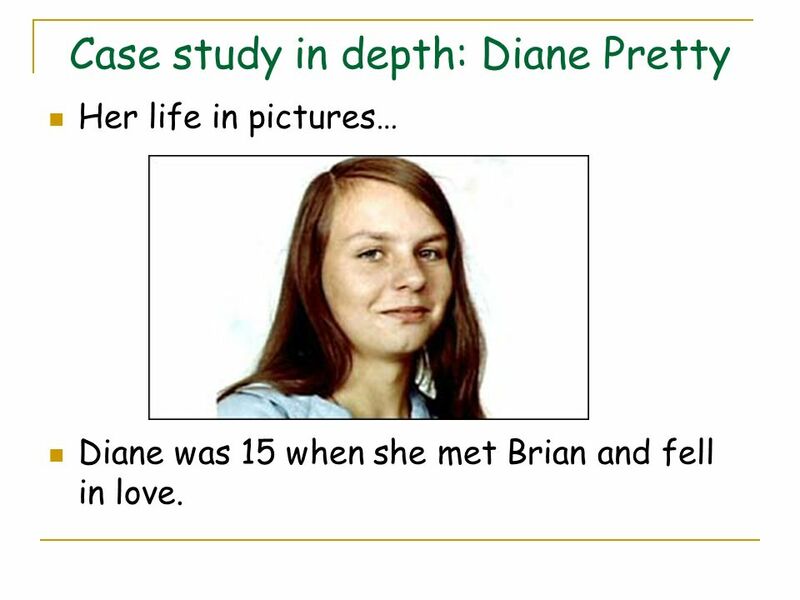 Her life in pictures… Diane was 15 when she met Brian and fell in love. 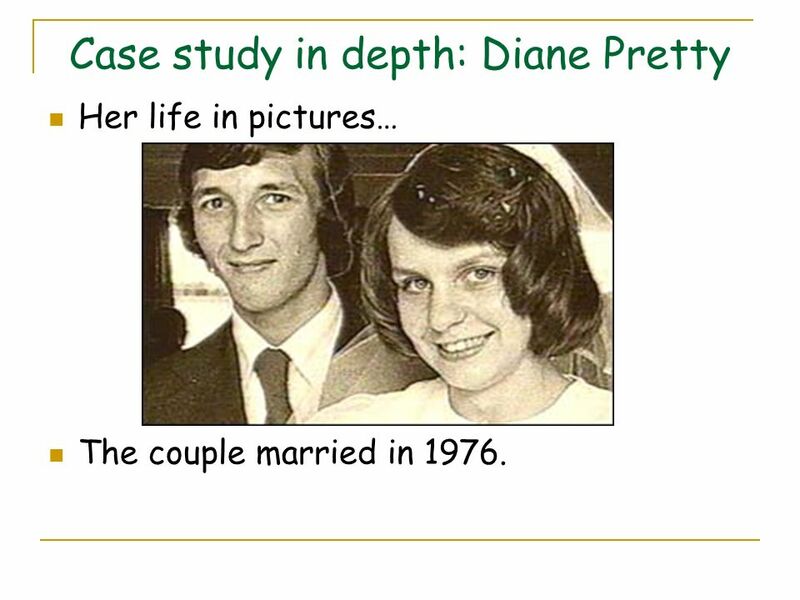 Her life in pictures… The couple married in 1976. 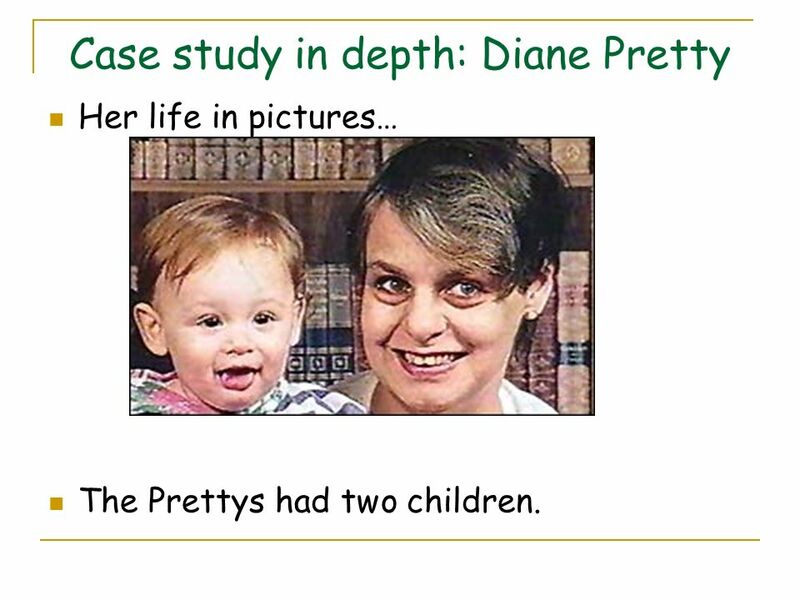 Her life in pictures… The Prettys had two children. 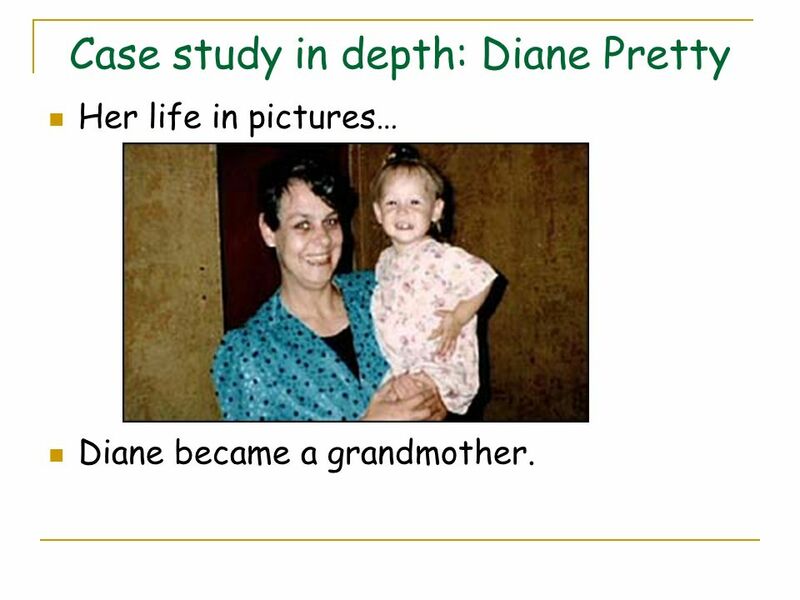 Her life in pictures… Diane became a grandmother. 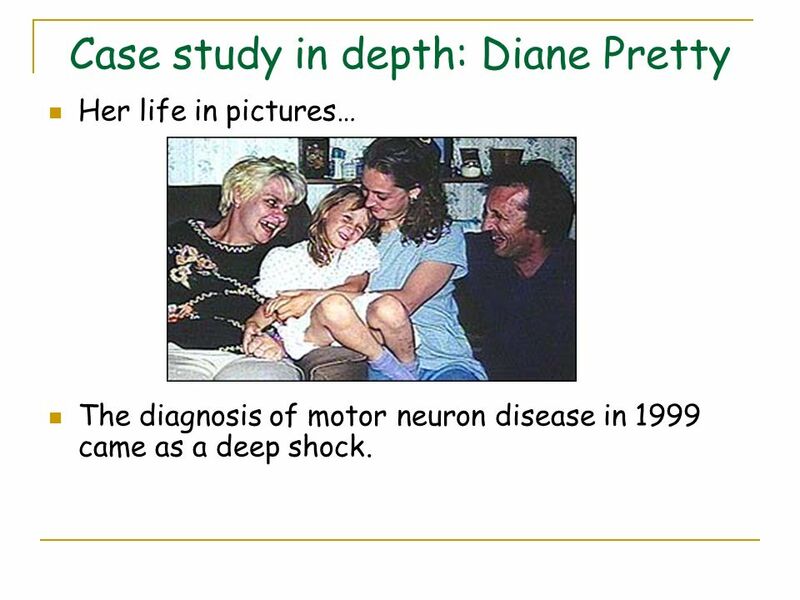 Her life in pictures… The diagnosis of motor neuron disease in 1999 came as a deep shock. 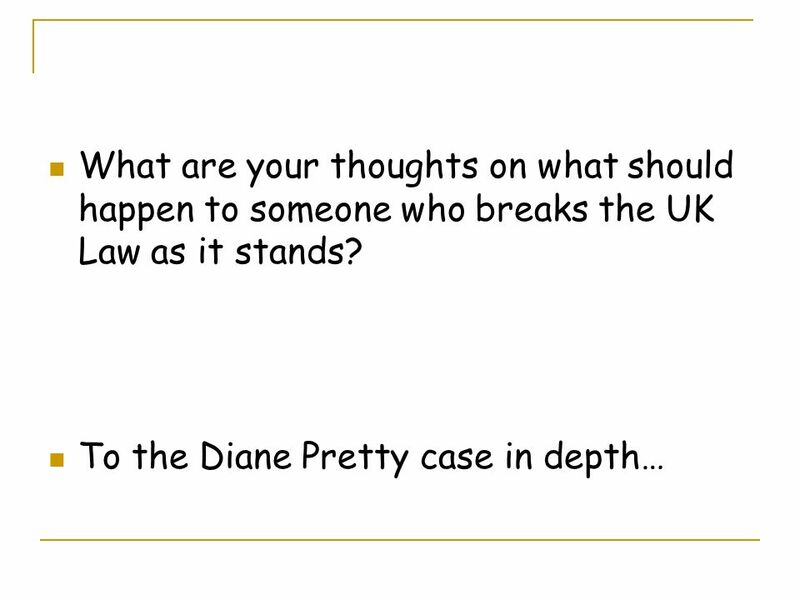 14 Diane Pretty wanted to take a different approach to the law. She wanted someone to end her life because she was so crippled she could not do it herself. She argued, amongst other things, that Article 3 of the European Convention on Human Rights established the right of individuals not to receive inhuman and degrading treatment. 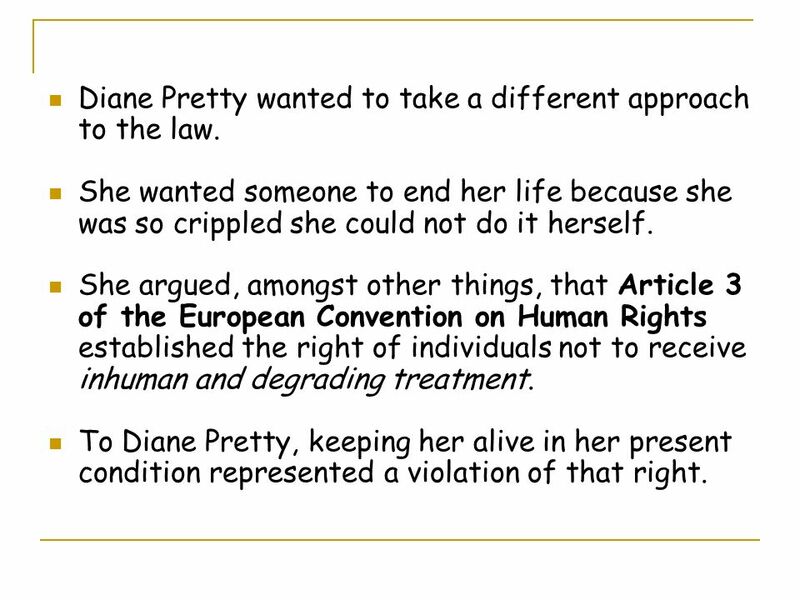 To Diane Pretty, keeping her alive in her present condition represented a violation of that right. 15 Do you think that keeping her alive is in violation of this human right? Article 3 of the European Convention on Human Rights: no one shall be subjected to torture or to inhuman or degrading treatment or punishment. Her life in pictures… The legal process was long and hard but she was determined to take it as far as possible. 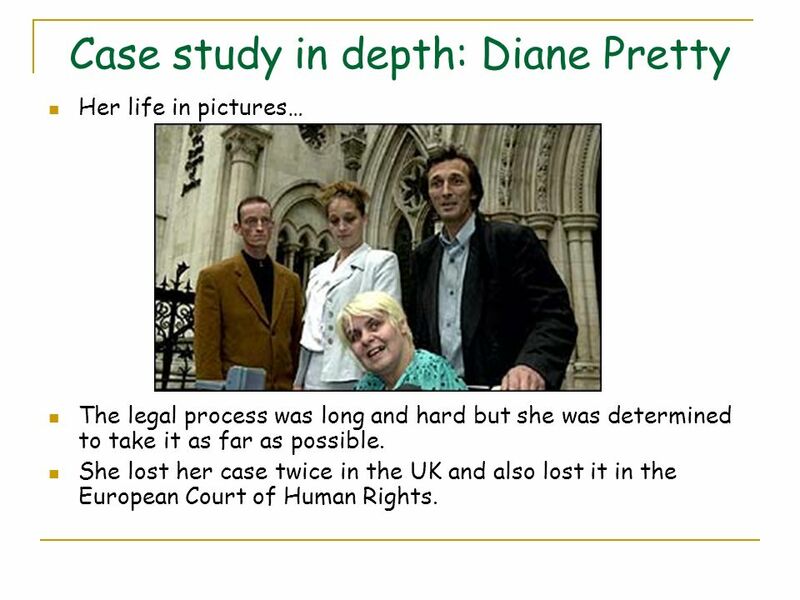 She lost her case twice in the UK and also lost it in the European Court of Human Rights. 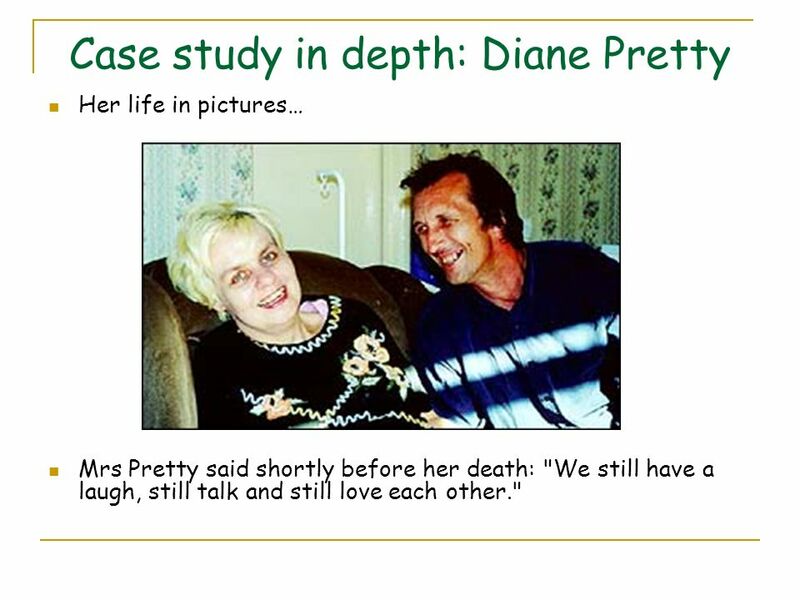 Her life in pictures… Mrs Pretty said shortly before her death: "We still have a laugh, still talk and still love each other." 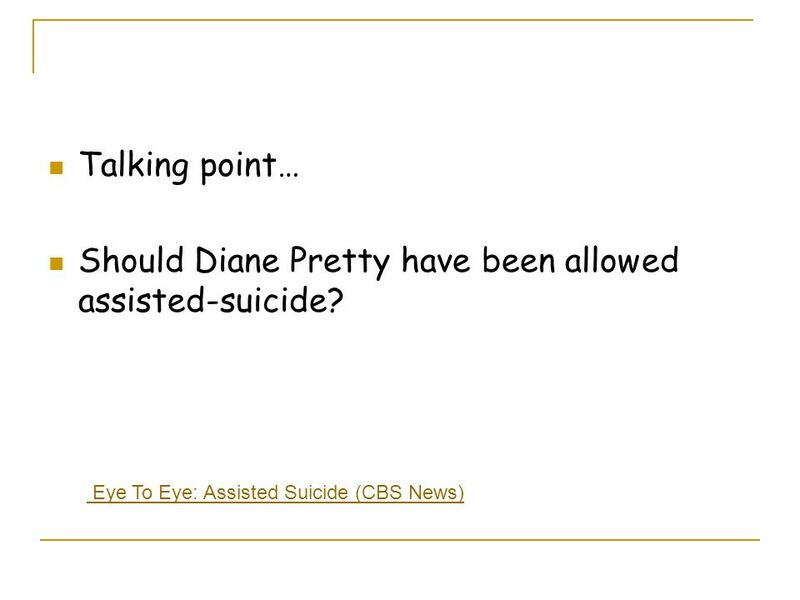 19 Should Diane Pretty have been allowed assisted-suicide? 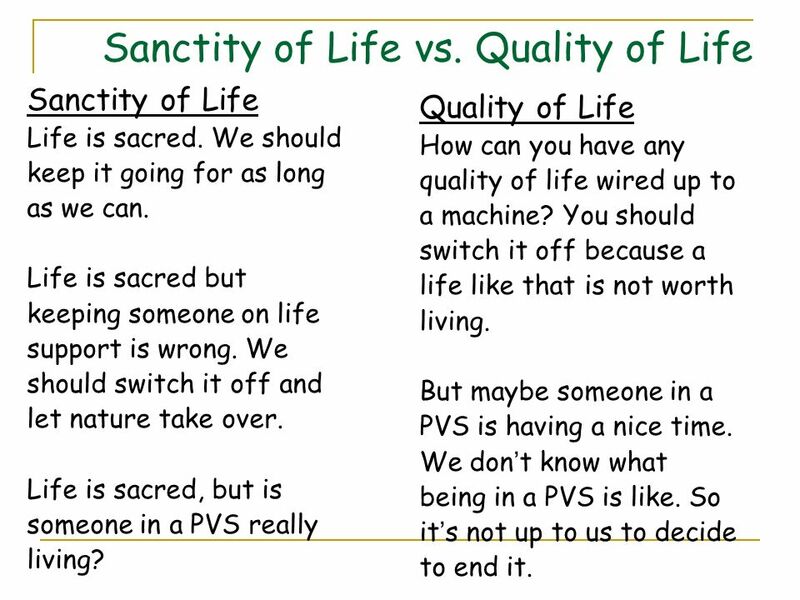 Download ppt "Sanctity of Life vs. Quality of Life"
Capital Punishment. The Death Penalty. Lesson Objective: To understand what capital punishment is and why people disagree over the issue. To decide what. Death and the Law. Suicide  the act of intentionally ending one’s own life  became illegal in the 13th century - it was a crime to commit suicide, and. Children’s Criminal Proceedings Act Consider the two situations… 24 year old male13 year old male. Drill - Has anyone ever committed a crime against you? If so, what? HOLT, RINEHART AND WINSTON A MERICAN GOVERNMENT HOLT 1 The U.S. Legal System Section 1: U.S. Law Section 2: The Criminal Justice System Section 3: Corrections. COMMITMENT 1. CIVIL COMMITMENT – COMMITTMENT BECAUSE OF MENTAL ILLNESS ITSELF 2. CRIMINAL COMMITMENT – COMMITMENT BECAUSE NGRI (NOT GUILTY BY REASON. Criminal Law Aspects Homicide –The unlawful killing of a human being Murder –Common Law offence The unlawful killing of a human being under the Queen’s. Nunu Poe PHIL 1722 Section- 60 Diana Pretty From England Not allow assisted suicide in England Have family Was rejected from both England and European. Medicine, mistakes and manslaughter: a criminal combination? Dr Oliver Quick University of Bristol. Evil King John? Today’s Objective – To consider how we can reliably use peoples opinions about King John to answer the question: Was King John a good or. 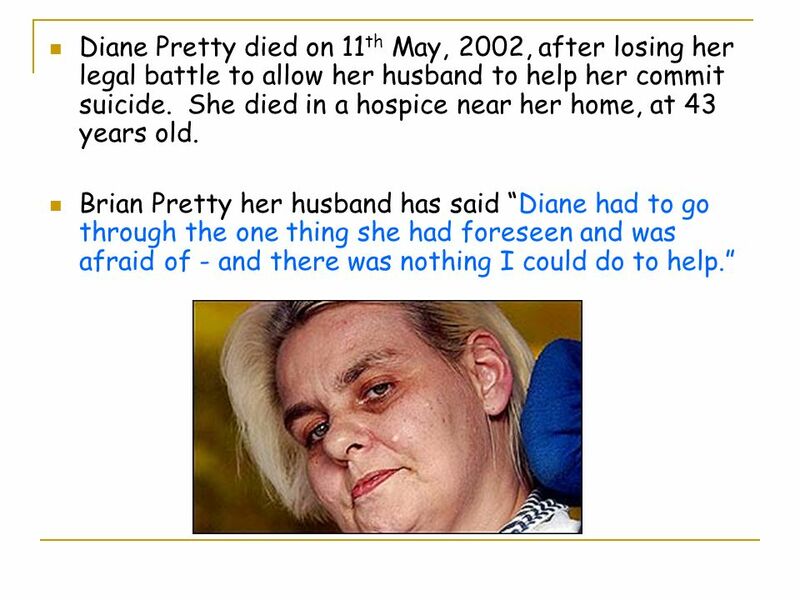 Issues with Diane Pretty. Contravention of human rights by not allowing husband to help her commit suicide. She said after decision “The Law has taken. ELS BAIL. Bail Bail is the release from custody, pending a criminal trial, of an accused on the promise that money will be paid if he absconds. The decision.